Figure 1. 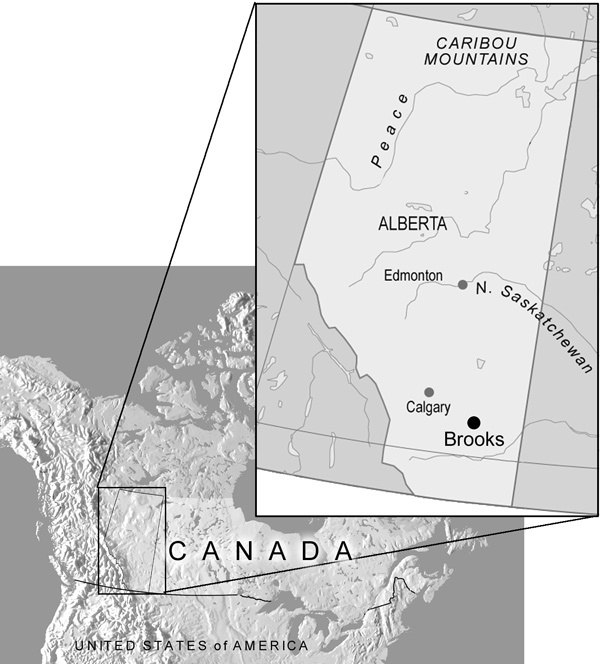 One large Centrosaurus bone bed, called BB43, is located along the Red Deer River of Dinosaur Provincial Park, about 50 km north of Brooks, Alberta. About 93% of the BB43 fossils are Centrosaurus ceratopsian dinosaurs. In other words, the bone bed is almost monospecific.4 An analysis of the bones further indicates that the dinosaurs died elsewhere and were later transported into their final resting place. Much taphonomic information supports this deduction (taphonomy, from Greek taphos=death, is the study of how an organism or part thereof became a fossil). For instance, the fossils are typically concentrated along bedding planes and/or erosional unconformities with the suggestion of a 5-metre deep by 60-metre wide channel. The long bones are current aligned. Most of the remains are fragmentary, broken and fractured. The material represents a lag deposit with most small and light skeletal elements missing and being primarily composed of portions of large adult-sized skeletal elements. Carnivorous dinosaur teeth, especially from the theropod Albertosaurus, and very rare tooth marks on the bones have been found in the bone bed. Thus, the condition of the bones indicates modification by an external force, probably in a high-energy watery flow as the sedimentology of the contained sandstone indicates. The particular bone bed under discussion is found in water-laid sandstone with east-southeast directed paleocurrent indicators. The idea of a waning flood phase is deduced from the fining upward sequence from the lag of dinosaur bones to fine sandstone. Figure 2. 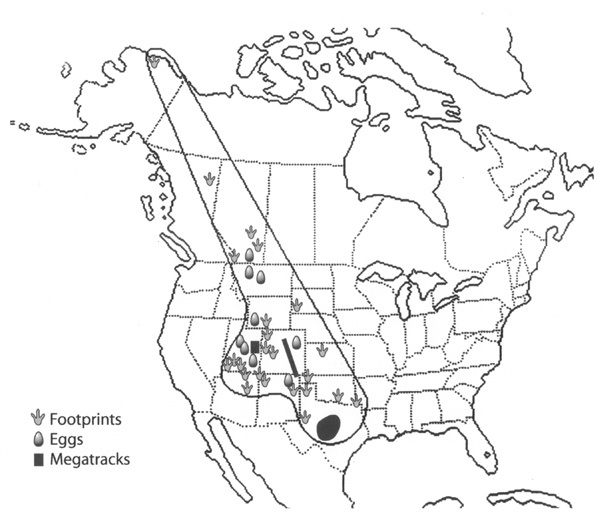 Postulated area of briefly exposed Flood sediments in western North America based on dinosaur eggs, tracks and bonebeds. The authors add that other bonebeds in southern Alberta show the same pattern of preservation as BB43, indicating a number of large watery catastrophes. Large dinosaur graveyards in Montana, Wyoming, and other areas of the Earth also provide evidence for either a watery catastrophe or a waterborne mass flow.6 One exception to this conclusion was the Mongolian dinosaurs that were claimed to have died and been buried in a sand storm. On further analysis, these dinosaurs were likely buried in a waterborne mass flow.7 Uniformitarian scientists predictably interpret all these dinosaur graveyards as evidence of river flood processes. But the number of dinosaurs, the state of preservation indicating rapid burial, reworking and fossilization; the monospecific nature of many bone beds; and the lack of babies or young juveniles in practically all bone beds indicate a watery catastrophe larger than river floods. The evidence is more consistent with the Genesis Flood in which the catastrophe would cause dinosaurs of the same kind or species to herd up, like elk when the weather turns cold, and then to be killed together during the onslaught of the Flood. These bone beds, generally found in the same geographical region as dinosaur eggs and tracks on thousands of feet of previously laid Flood sediments, imply areas of temporarily exposed sediments during the early Flood. Figure 2 shows the generalized area of exposed sediments or a series of shoals that contain many dinosaur bone beds plus the evidence of live dinosaurs in the form of eggs and tracks.8,9 Flood sediments could easily be exposed for relatively short periods by at least four mechanisms that would be operating during the Flood: 1) tides, sometimes with large amplitude; 2) tsunamis; 3) upward vertical tectonics after rapid deposition of sediments, and 4) the dynamics of ocean currents on shallow continents in a globally flooded Earth.10 The dead dinosaurs on this exposed sediment could be scavenged by carnivorous dinosaurs, since their teeth are often found in the bone beds of western North America. Other dinosaurs would lay eggs on these temporarily exposed Flood sediments. Dinosaur tracks would be expected also. 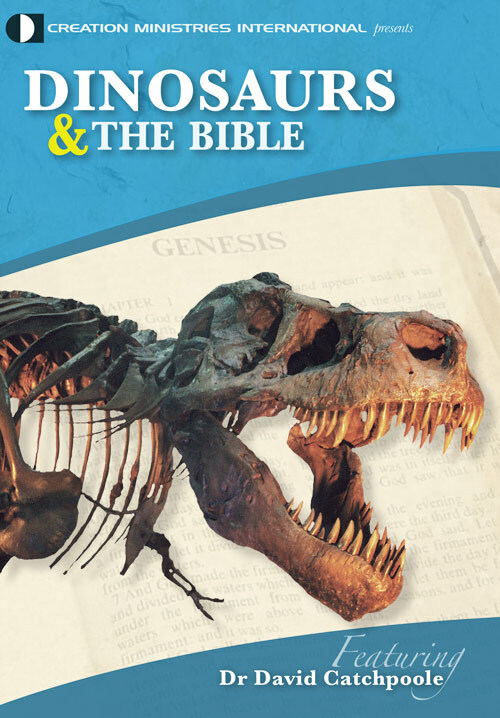 The evidence is more consistent with the Genesis Flood in which the catastrophe would cause dinosaurs of the same kind or species to herd up … and then to be killed together during the onslaught of the Flood. As the floodwaters returned, the dead dinosaurs would be catastrophically reworked into the bone beds we discover today. The lack of babies or young juveniles, except in nesting areas, can be explained by dinosaurs fleeing the encroaching floodwaters and abandoning their young. Water current winnowing could explain the lack of young dinosaurs, as postulated in the Centrosaurus bone bed described in this article, but one would expect that the products of the winnowing would be found buried somewhere, but apparently no such bone bed has been found. If it were a river flood, there are always slackwater areas and eddies where the bones of young dinosaurs should have been deposited. It is more likely there were few if any young dinosaurs in the original death assemblage. Since fossilization, especially of a large dinosaur, not to speak of thousands of them in a bone bed, is a very rare event,4 the Genesis Flood provides a plausible mechanism for rapid fossilization. Ryan, M.J., Russell, A.P., Eberth, D.A. and Currie, P.J., The taphonomy of a Centrosaurus (Ornithischia: Ceratopsidae) bone bed from the Dinosaur Park Formation (Upper Campanian), Alberta, Canada, with comments on cranial ontogeny, Palaios 16:483, 2001. Return to text. Currie, P.J., Hunting dinosaurs in Alberta’s great bonebed, Canadian Geographic 101:34–39, 1981. Return to text. Ryan et al., Ref. 1, pp. 482–506. Return to text. Ryan et al., Ref. 1, p. 501. Return to text. Ryan et al., Ref. 1, pp. 502–503. Return to text. Oard, M.J., The extinction of the dinosaurs, Journal of Creation 11(2):137–154, 1997. Return to text. Snelling, A.A., Waterborne gravity flows buried Mongolian dinosaurs, Journal of Creation 12(2):133–134, 1998. Return to text. 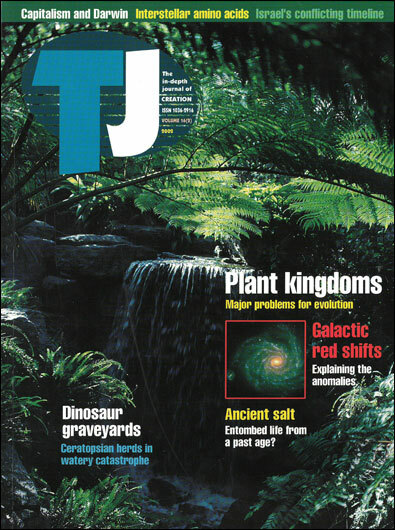 Oard, M.J., Dinosaurs in the Flood: a response, Journal of Creation 12(1):69–86, 1998. Return to text. Barnette, D.W. and Baumgardner, J.R., Patterns of ocean circulation over the continents during Noah’s Flood; in: Walsh, R.E. (Ed. ), Proceedings of the Third International Conference on Creationism, Technical Symposium Sessions, Creation Science Fellowship Pittsburgh, Pennsylvania, pp. 77–86, 1994. Return to text.